The Tourism Council of Frederick County (TCFC) plays a key role in the almost $400-million in tourism-related revenues which are generated for businesses and attractions. As a TCFC member, we’ll give you opportunities for visibility which will have an important financial impact on your given enterprise. Sign on with TCFC and help us increase local tourism revenues through your success! The Tourism Council of Frederick County is a public-private partnership dedicated to enhancing the economic benefit of tourism for Frederick County&apos;s businesses, attractions, local governments, and residents. Membership is open to businesses and individuals interested in promoting tourism in Frederick County. To access the Visit Frederick Extranet, available to member only, click here. For detailed instructions on using the Extranet, click here. TCFC is part of a cooperative statewide marketing effort that includes the State Office of Tourism Development and Destination Marketing Organizations for each county in Maryland. TCFC carries out key marketing programs for our community, including Destination Marketing, Group Tour Marketing, Frederick Historic Sites Consortium, Visitor Information Centers and more! The tourism industry brings almost $400-million dollars into Frederick County each year from visitors from 50 miles or more away. TCFC membership allows you to actively participate in marketing programs that have true impact on all segments of the local economy. TCFC distributes quality promotional literature worldwide and serves as the primary contact for domestic and international media. As a member of the Tourism Council, your business is exposed to leading travel and feature writers, editors and publishers. TCFC is comprised of several hundred local businesses. Membership provides a great way to make connections and "build bridges" for any business. 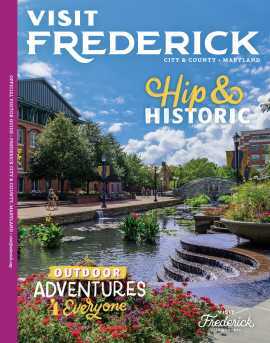 Free listing and discounts on paid advertising in the Frederick Visitor Guide, the main fulfillment publication given free of charge to all visitor inquiries. The guide is also mailed to potential visitors, distributed at the Frederick Visitor Center, as well as the Maryland State Welcome Centers, and at area businesses. A total of 150,000 guides are distributed each year. The opportunity to display your brochure in the Frederick Visitor Center, which greets tens of thousands of visitors each year, free of charge. Free listing on this website: www.visitfrederick.org This website receives tens of thousands of user session visits each year. Regular updates on our marketing efforts on your behalf, including Tourism Today our quarterly newsletter, leads from the motor coach trade shows we attend, and several annual networking events each year.